If you need to consult maps without consuming many features of your PC, know and see how to view the world map in the terminal with MapSCII. 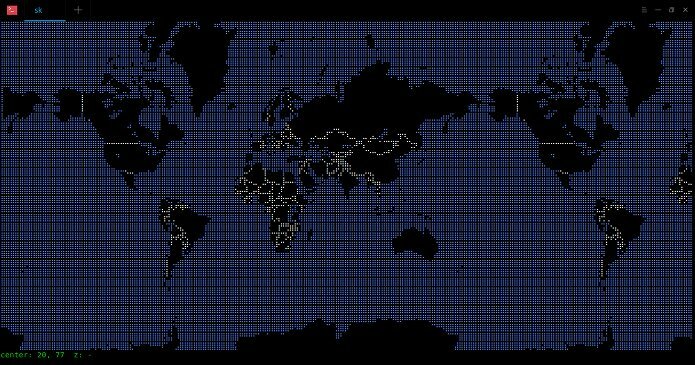 MapSCII is a world map renderer (Braille and ASCII) for xterm-compatible terminals. It supports Linux, Mac OS and Windows. The program uses OpenStreetMap to collect the data. MapSCII is not just another project hosted on GitHub, and it’s really impressive. You can use the mouse pointer to drag and zoom and search for a location anywhere on the world map. Highly optimized algorithms for a smooth experiment. You can install it on your own system, for this, see below the installation instructions of the program. To move through the map, use the up-arrow, down-arrow, left-arrow, right-arrow keys. To zoom in / out, use the “a” and “z” keys. In addition, you can use the mouse scroll wheel to zoom in or out. To exit the map, press “q”. And then? Did you like the app? Leave your impressions in the comments.